Meet and reconnect with friends from the Marion days. We have reserved the Price Chopper Patio for Tuesday May 29th for a Marion Club event as the Royals play the Minnesota Twins at 7:15pm. The patio is located in right/center field next to Rivals sports bar and will accommodate 60 people. To get to the patio, enter gate E on the east side of the stadium and walk towards Rivals in center field. We will be at gate E with your tickets. This is the only way for you to get your tickets. The menu will be queso and chips, pulled pork sandwiches, potato salad, hot dogs, cookies and Pepsi products. Adult beverages can be purchased at Rivals next door. The price for the food and ticket is $60.00. You can reserve your place right here or by sending a check to Marion Club (send us a message if you need more info). Parking is not included and costs $15 when you enter the parking lot. Additional information and updates will appear here or on the club Facebook page. 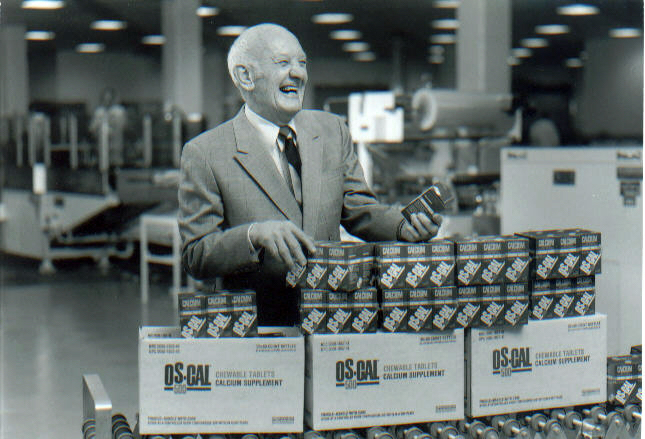 Mr. K at the OS-CAL Packaging Line. 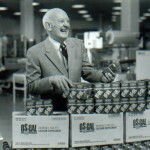 More than sixty years ago, in June of 1950, Mr. Kauffman founded Marion Laboratories and embarked on a journey of entrepreneurial success that still resonates with us today. On June 4th and 5th, 2010, hundreds of Marion Associates and guests gathered in Kansas City to celebrate Mr. K’s vision and legacy during a fun filled weekend. For pictures, check out our picture gallery. Events kicked off with a winning Royals game and tailgate party on Friday night. Hugs, hoopla, laughter and more than a few trips down Memory Lane marked the day for nearly 500 associates and guests. Reminiscent of the “Old Days” everyone continued the festivities inside Kauffman Stadium, where three sections of seats had been set aside so everyone could sit together. Special thanks go out to Mollie and Phillip at Brancato’s Catering and their staff for providing excellent service, delicious food, libations and a big tent for shade. Thank you also to the Boy and Girl Scouts from St. John Francis Regis school in Kansas City, Mo, who helped with handing out the T-Shirts. On Saturday morning about 200 attendees marveled at the soon to open Kauffman Center for the Performing Arts. Julia Irene Kauffman, Chairman and CEO of the Muriel McBrien Kauffman Foundation, and Jane Chu, President and CEO for the Center, welcomed everyone to a special hard hat tour of the construction in progress. Associates of the J.E. Dunn Construction Companyprovided fascinating insights into the behind the scenes work and planning details that are sure make the Center a showpiece far beyond Kansas City. Kudos to everyone for accommodating such a large group!Closing the celebrations on a festive note, nearly 300 associates and guests gathered at the Kauffman Foundataion for a reception and catching up with new and long time friends. Julia Irene Kauffman rejoined the group and thanked everyone for their service over the years before introducing a video tribute to Mr. K. Throughout the evening, video from the early days of Marion Labs played in the background while everyone shared updates and hilarity. Many people at Kauffman Foundation ensured that the evening would a success, including their culinary wizards who conjured up many tasty morsels for everyone to enjoy. What a weekend! Although unable to attend the festivities, Fred Lyons wanted to send this special message to all Marion Associates and their families. The Marion Spirit Lives On In time for the anniversary weekend, the Kansas City Business Journal took a look at how the Marion Spirit lives on in various companies founded by former associates. Join the Marion Club to receive e-mail and postal mail updates about Marion Club events. Contact us via the web site with any questions. Site support provided by CyCom Solutions, Inc.